The help link didn’t live up to its billing. Since I knew I wasn’t guilty of posting videos that were hateful, graphic, or attacking an individual or a group (although I occasionally take a poke at Green Bay Packers fans), I was only left to surmise that the problem must have been with a musical soundtrack I had added to highlights of my daughter’s high school basketball games. So to avoid being banished from Facebook without trial or even explanation, a la Star Chamber, I removed every video that had even a hint of recorded music. I understand that Facebook is dealing with millions of videos, and that disposing of reported violations as quickly as possible is important. It would help if they would provide at least the title of the video that had been removed, or if they would check a box as to which of the terms they had judged were violated. It’s fine for Facebook staff to be judge, jury and executioner on alleged video violations; it’s their site, and it’s free to use. But providing at least marginally helpful feedback on the nature of the charges would help prevent future problems. So…I’m assuming the problem was with a video I had uploaded to this group three years ago. SMUGgles know I’m about as big a fan as Facebook has. I just wish they would provide more clarity when problems are reported. 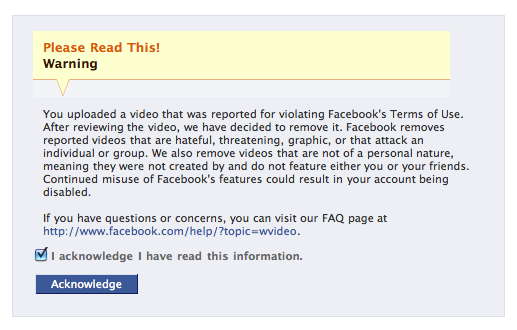 I got the same message, but I’ve never uploaded a video to Facebook in my life. Could this be some kind of spam? Jane – I might just go ahead and do that…although I have gotten some interesting feedback from Evelyn, for instance…that I want to include as well. I work with Evelyn and we’re administrators on the same page…and it may have been a video that one of our fellow administrators added that was the problem. Lee I’ll be interested to learn how FB responds.